I went to watch this movie because showed this was rate movie bla bla..... but I found the movie was very bad. The begining looked interesting but after 20 minutes the whole thing was going in circles. What a trash. If you didn't see the first two films, then you would be lost. It was entertaining and I enjoyed the ending, with the exception of Bruce Willis's weak end. Excellent movie with a great cast!!! Horrible movie. I knew after I found who directed this movie. This movie was zzzz. No idea how his director still making movies. This is garbage and totally dragged on and on. The last 20 minutes was pointless and could have been cut out after what ever happened to the 3 main actors. This is not worth your time or money. I am glad to see this is at 2 stars now hopefully it goes down to 1. No way. This movie was the worst film from this director. Predictable and the actors are both well past their prime. I check a lot of sites before seeing a movie. This one is polling badly everywhere. I'll skip. So..... why didn't the bad dude just close his eyes and attack? Loved Unbreakable, Split was 'Meh', could not wait for this movie to be over and leave the theater. Was really looking forward to this, mostly for the Bruce Willis character. Cool they got the original kid to play the same part. So disappointed in the movie though. 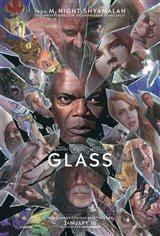 i thought this movie was an entertaining continuation of the first 2 movies (Unbreakable and Split). It helps if you enjoy comic books. Save your money or see something else. I don’t have a clue why this movie was boring. Seriously? The director was trying to do another x-men movie. Lol. Failed. The worst movie of the year. We did not like this movie at all. We left 20 minutes before was going to end. The movie was too predictable. I enjoyed the movie - if you like the prior 2 movies, you'll enjoy this one. The movie starts okay but suddenly falls into Shyamalan narrative style and etc. I felt this movie like a copy from other copy. I understand why this film has received mostly negative reviews. The concept is interesting, but it's not executed with the emotional depth Unbreakable promised 19 years ago. David, Elijah, and Kevin are really cool characters. I think the story should have gone in different directions to further explore their inner-lives and struggles, and give them a far more satisfying conclusion than the one we received. Nothing new to watch from this story. Good popcorn. I thought it was a good movie. I don't know why it is getting so many bad reviews. I guess the bad reviews are coming from CGI loving morons who probably love movies like the Transformers' franchise. Oh please give us a break from this director. The movie made me snore. Zzz. What exactly I watched last week? This movie is horrible. The trailer is much better than this movie. My money back, Shyamalan should stop long time making movies. This movie was stupid. Stupid, boring, waste of time.....don't waste your money, safe it for a movie that you really want to see. I know this was a follow-up movie but I didn't realize it until half way thru, it was all over the place, kind of stupid. If you don't see it, you don't miss anything. I didn't even realize the original cast was in it. Save your money. A lame movie as his director. Pretty slow moving for a super hero movie. Samuel Jackson again? Bruce Willis? Geriatric super heroes? Let's just do another sequel to Cocoon while we're at it. Hollywood is done. Wow...really disappointing, The whole movie was like one long introduction, there was no real story, I was expecting so much more from this director and these actors ?? Well done and great performances all around!